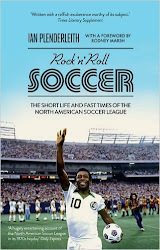 ROCK N ROLL SOCCER: "Jimmy bloody Hill, Jesus wept"
“Washington DC is a city notorious for its inability to function,” is the opening sentence to chapter 8 of Rock n Roll Soccer. I focus on DC in this section not just because I’ve lived there for the past 15 years, but because it’s an extreme reflection of the more unstable end of the North American Soccer League. In the course of the NASL's 17 years, it managed to found and flunk no fewer than four different teams. Jimmy Hill’s involvement in the NASL is a little known oddity among British football fans, lost amid his varied and fascinating career as a player, a campaigner, a manager, a director and, most notoriously of all, as a pundit. Those in the US who came across him as an owner of first the Detroit Express, and then the Washington Diplomats, have few kind words for the man with the tidy-beard chin – he managed to drive both teams into bankruptcy and extinction in the space of three years. The quote at the head of this piece comes from an interview with Englishman Clive Toye, the former Daily Express journalist who, together with league commissioner Phil Woosnam, was largely responsible for building the NASL. It was Toye who signed Pele whilst general manager of the New York Cosmos. Later, at Chicago and Toronto, he watched in exasperation as clueless, profligate owners like Hill came in and ran clubs into the ground, followed eventually by the league as an entity. After the demise of the Washington Whips (1967-68), the Darts (1970-71) and the Diplomats (1974-81), one final attempt was made to keep a team in DC. Team America was made up of US national team players, including some hastily fast-tracked foreigners who found themselves in possession of a US passport. The idea was to have the US team playing in the domestic league to help them prepare for qualification for the 1986 World Cup. Like many ideas in the NASL, it was a brave, bold failure, for reasons outlined in the book. It lasted just a single season (1983) - another wonderful mess. 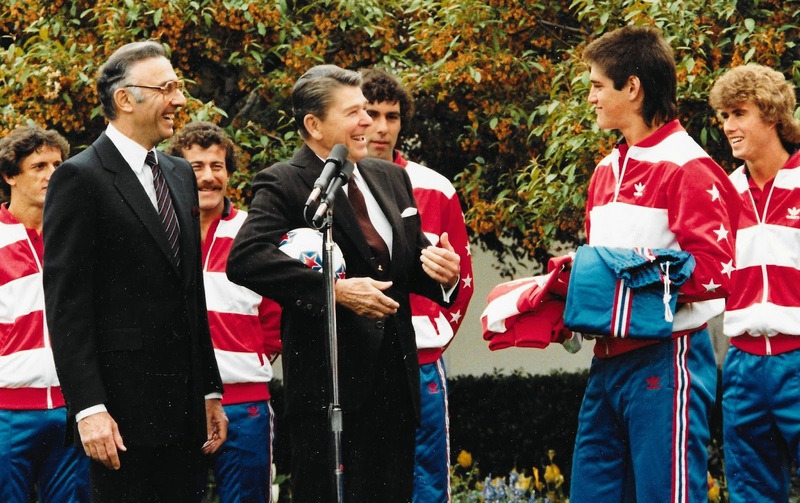 Still, at least they had the dubious honour of meeting the President (see picture). Here are a couple of scene-setting paragraphs from the early part of this chapter, Broken teams in dysfunctional DC: Cruyff, the Dips, the Darts and the Whips. Washington DC is a hard city to warm to, and you don’t meet many people who laud it as their beloved home town. There is no city centre, as such, while a revolving cast of diplomats and politicians mean that much of its high-powered population remains fluid, and emotionally unattached to the capital. The statues and monuments that adulate former presidents give it the feeling of an old eastern European capital city that exists to at best commemorate, and at worst deify, bronze- and concrete-sculpted dead men. On the plus side, it boasts a jaw-dropping mile of mesmerizing museums and art galleries on the National Mall that almost make up for the fact that, in daily real life, the archetypical DC operator will be a lawyer or a lobbyist too busy to talk to you for more than 60 seconds at most. The political inertia is in stark contrast to the speed with which thrusting personal ambition can push smart and highly motivated individuals into positions of influence. It’s hard to say what they end up influencing beyond their own personal wealth and reputation, but complain about this and you’ll be met with a world-weary shrug. It’s DC, what do you expect? Don’t take it personally, it’s just politics. Bearing all this in mind, it’s no surprise that during the seventeen-year span of the North American Soccer League, the city managed to consume and then spit back out no fewer than four soccer teams. Washington DC was the market that everyone believed was made to succeed. When one team failed, someone else came along and gave it another try, as though importing a fresh new ideology that would kick-start the political paralysis, or simply trying to pass some straightforward piece of legislation through Congress. No matter how obvious and logical that law might have seemed to a normal person standing on the outside, once it reached DC it was subject to wrangling, disputes, compromises, distortions, setbacks, and ultimate failure. That’s just DC. Want to put money into a soccer team there? Sure, it’s a potentially large and wealthy market. Best of luck! See you in a year on the bottom steps of the Lincoln Memorial dripping tears into your begging bowl.